to customize their blog layout and analyze traffic coming to their blog's RSS/Atom feed. Step 1:Type feedburner.google.com in your browser window. Or Go to Feedburner link from Dashboard. 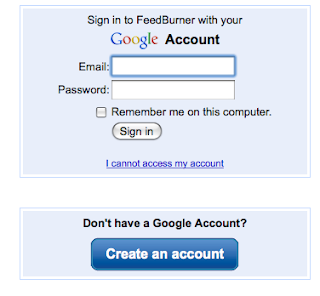 Step 2:You can Sign In to the Feedburner with your google account. If you don’t have a google account first Sign Up for a feedburner account. 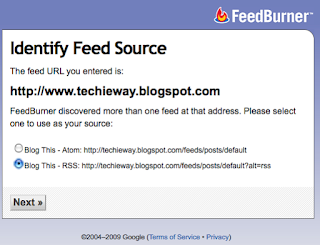 Step 3:Type the blog address and you are ready to use the feedburner features. Step 4:Now Select your RSS/Atom feed.Click on RSS feed address because RSS is good for dynamic content as shown below in picture. Headline Animator: After activating this feature, there has been a drastic increase in page impressions(from 0 to 1000 per month) of my blog. Do you know how much page impressions I was getting earlier. It was virtually 0.Now you must be curios to know about what a headline animator is? A headline animator is a graphics window that has been especially designed to promote your blog ’s content The feature allows you to create more than 1 headline animators. So use them wisely to promote your blog ’s content. The feature is good for increasing readers and Page impressions. Feed count: Activating this feature lets you to count the number of readers of the blog who subscribe to your posts via E-mail/RSS feeds. It gives you the choice of directly adding this widget to your Blogger template or pasting HTML code in Blogger template. Subscribe Via Email: Activating this feature lets the bloggers to offer subscription via E-Mail. I suggest you to use this feature. Analyze Traffic: You can analyze traffic to your blog with the help of different Graphical reports. Adsense: You can display adsense ads and also manage your ads from feedburner. The above list is only few of the features of feedburner tool. You can explore a number of other features of this tool. All the features of this tool are almost self-explanatory. 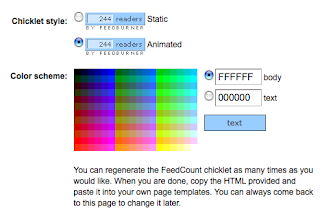 I hope you will be able to burn your blog feed with feedburner. And in case face any problem s comments welcome.